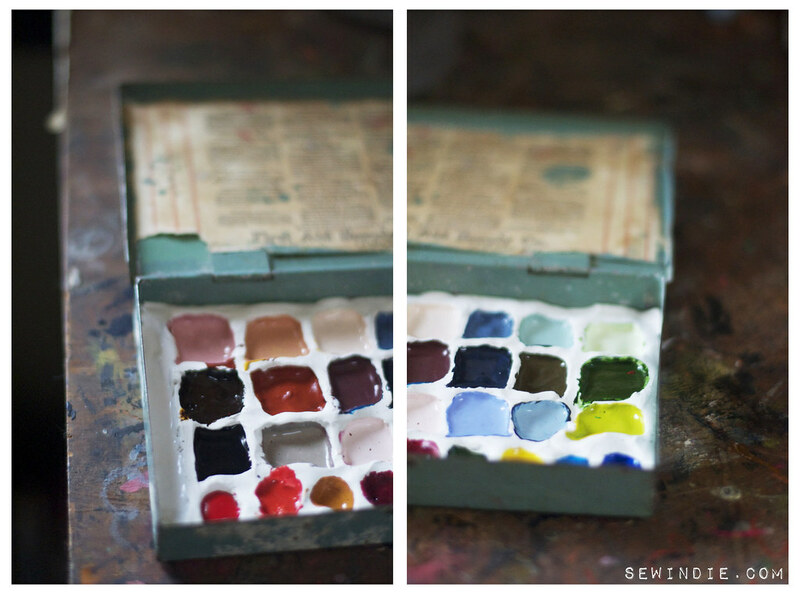 thumbprint watercolor box — Serif & Script Co. In this post I'm going to show you how to make yourself a watercolor box. I use travel watercolor boxes all the time, and it's necessary for me to have custom colors already mixed. (I'm terrible at mixing colors on the fly, and I waste a lot of paint!) 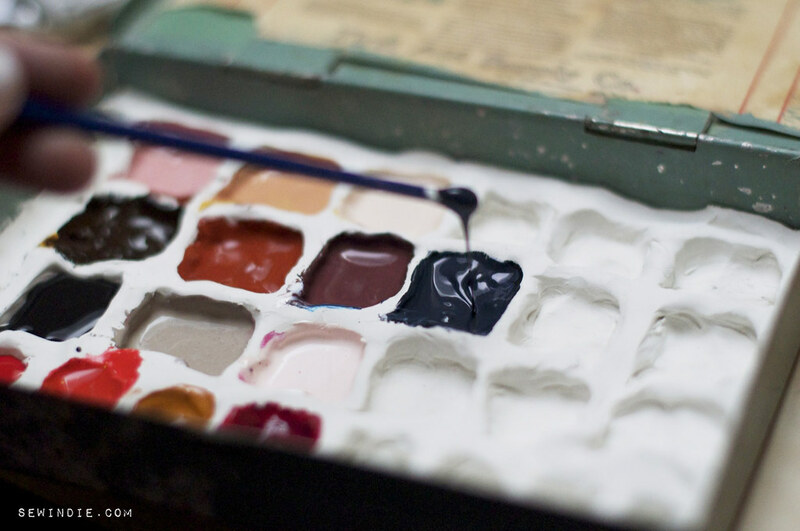 This is my tried-and-true way to create a sturdy, beautiful, useful paintbox. Hope you enjoy it! a metal box - anything from an altoids tin to what i have, which is a vintage first aid kit. i've also seen small tool kits work for this. shallow tins are recommended, less than 1.5" high, but if you plan to stuff a lot of material in there (like rags, brushes, etc.) it can be higher. a thin tool for mixing, like the back of a paintbrush or pencil. any dollar store brush will do, as it's for mixing, not painting! oven-bake clay. i used the Sculpey brand, but any oven-bake kind will work. white clay is preferred here - it's easier to perfect the colors you want without any extra distractions. (terra cotta or grey will trick your mind into mixing cooler and brighter colors.) i used 10 oz. of clay for my watercolor box, which is about 3.5"x6.5". if you use an altoids tin, you might just need 2 or 3 oz. tubes of watercolor paint. prices here will wildly vary, but you can get decent color from even the cheapest tubes if mixed correctly. you'll want to get a large tube of titanium white, and smaller tubes of warm & cool versions of red, yellow, and blue, and brown. (raw umber is a "cool" brown, burnt umber is a "warm" brown. 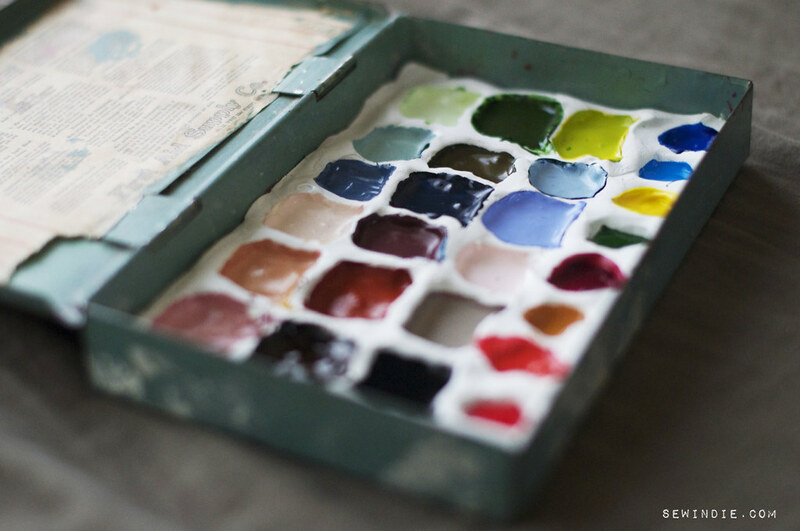 read more about color theory.) i like to buy a few variations of each, plus secondary colors like greens and purples. even though you CAN mix those colors, i think you can come up with more interesting mixes with a couple of well-selected pre-made colors. i like adding a little white paint to most colors, as it helps them become more opaque on paper. white is often cheaper, as well, and makes your paint go farther. i'd suggest NOT buying cool yellow (lemon) and cool green (veridian), as they're not really desirable colors, ever. the first thing you'll do is make sure your metal tin is clean. wipe it out to remove any dust. take out your clay, and flatten it to about 2/3"-1/2". push it into the corners of the tin, covering the entire surface. then, take your thumb and make evenly-spaces indentations in the clay. push as hard as you can, making sure the bottom of the tin isn't exposed. as you go along, push toward the unfinished areas, that way you don't alter the previously sculpted sections. once you're done making all the indentations, check to make sure no sections are too thick or too thin. bake the tin at your clay's specifications. i baked mine for 16 minutes at 275F. after you let the tin cool (it shouldn't take more than five minutes, really) get ready to mix your paint. (the fun part!) personally, i could never bring myself to put in a color straight from the tube. experiment with mixtures, and your work will come out more unique. even for a simple color, like yellow, i'll mix together three different kinds of yellow and a tiny dot of red and it'll be a totally "me" kind of yellow. this color blue is my FAVORITE color. technically, it's not "blue", it's called "payne's grey", and it's a staple in oil painting. it's a subtle, bluish-grey tone, and i'll mix it with a little brown to darken it just a bit. you'll want to mix similar colors, like reds and browns, blues and greens, magentas and purples. for my palette, i chose more natural colors with pops of bright, neon-ish colors. adding similar colors will give me a tighter color story on any image i paint, but rainbow palettes are good too, if you want an all-purpose palette. all-skin-tone or all-beach-tone or all-sky-tone palettes can be a real time saver if you already know what kind of images you'll want to paint. an important note: don't add black to your palette. it really muddies any color you'll mix it with. instead, mix together equal parts dark sienna and prussian or phthalo blue - it's black, but with more interesting color variations. let the paint dry overnight before using. when you're out of a color, just wipe it out and add more paint! i left a big section for white, then left all warmer colors on the left and cooler colors on the right. hope you guys come up with your own awesome color palette!